Edward Otho Cresap Ord (October 18, 1818 – July 22, 1883) was the designer of Fort Sam Houston, and a United States Army officer who saw action in the Seminole War, the Indian Wars, and the American Civil War. He commanded an army during the final days of the Civil War, and was instrumental in forcing the surrender of Confederate General Robert E. Lee. He died in Havana, Cuba of Yellow fever. Ord was born in Cumberland, Maryland, the son of James and Rebecca Ord. Family tradition made James Ord the illegitimate son of George IV of England and Maria Fitzherbert but he seems likely to have been the son of Ralph Ord, who was baptised at Wapping, Middlesex, in 1757, the son of John Ord, a factor from Berwick-upon-Tweed. He was considered a mathematical genius and was appointed to the United States Military Academy by President Andrew Jackson. His roommate at West Point was future general William T. Sherman. He graduated in 1839 and was commissioned a second lieutenant in the 3rd U.S. Artillery. He fought in the Second Seminole War in Florida and was promoted to first lieutenant. Ord was in California when the gold rush began, with its resultant skyrocketing prices. Since their military salaries no longer covered living expenses, Ord's commander suggested that the younger officers take on other jobs to supplement their income. In the fall of 1848, Ord and Sherman, in the employ of John "August" Sutter, Jr., assisted Captain William H. Warner of the U.S. Army Corps of Engineers in the survey of Sacramento, California, helping to produce the map that established the future capital city's extensive downtown street grid. 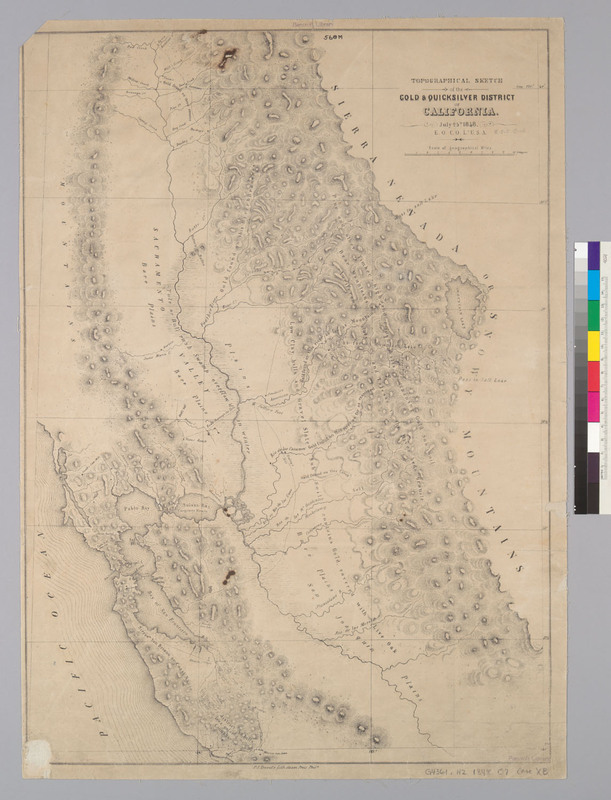 Ord also produced a map of the Gold and Quicksilver district of California dated July 25, 1848. Later, Los Angeles officials needed to have a survey of the public lands in order to sell them, and Ord was hired as the surveyor. He chose William Rich Hutton as his assistant, and together the two mapped Los Angeles in July and August 1849. Thanks to the efforts of these two men, historians have a fairly good view of what the pueblo of Los Angeles looked like at the middle of the 19th century. Lieutenant Ord surveyed the pueblo and his assistant Hutton sketched many scenes of the pueblo and drew the first map from Ord's survey. The Los Angeles City Archives has the original map produced by Hutton from Ord's survey. Ord was paid $3000 for his work on this survey. Ord was promoted to captain in 1850, while serving in the Pacific Northwest. He married Mary Mercer Thompson on October 14, 1854, and they eventually had thirteen children. One of their notable children was Jules Garesche Ord who was killed in action after reaching the top of San Juan Hill in Cuba. He was the officer who started and led the charge which Teddy Roosevelt followed. Another was Edward Otho Cresap Ord, II who was also a United States Army Major who served with the 22nd Infantry Regiment during the Indian Wars, the Spanish–American War and the Philippine-American War. He was also a painter, inventor and poet. After Abraham Lincoln's assassination on April 14, 1865, many in the North, including Ulysses S. Grant, wanted strong retribution on the Southern states. Grant called upon Ord to find out if the assassination conspiracy extended beyond Washington, D.C. Ord's investigation determined the Confederate government was not involved with the assassination plot. This helped greatly quench the call for revenge on the former Confederate states and people. During Reconstruction, Ord was assigned by Lt. Gen. Ulysses S. Grant to command the Army of Occupation, headquartered at Richmond. Subsequently, he was assigned to the Department of the Ohio until he was mustered out of the volunteers in September 1866. On December 11, 1865, he received the commissions of lieutenant colonel and brigadier general in the regular army for the Battle of Hatchie's Bridge and brevet major general of volunteers for the assault of Fort Harrison, all dating from March 13, 1865. Subsequently, commanded the Department of Arkansas, the Fourth Military District, and the Department of California. Well before his death, the Southern Pacific Railroad named a station in California, along its now-abandoned Colusa Branch, Ordbend as recognition of the nearby Ord Ranch, owned in the 1850s by Ord and two of his brothers. A peak named Mount Ord in Brewster County, Texas is named for him. There is a bust of Ord on display in the library of California State University, Monterey Bay, in Seaside, California. ^ "Mount Ord, FID:1342086". Geographic Names Information System (GNIS). U.S. Geological Survey. 1979-11-30. http://geonames.usgs.gov/pls/gnispublic/f?p=gnispq:3:::NO::P3_FID:1342086. Retrieved 2008-11-29. Flood, Charles Bracelen, Grant and Sherman: The Friendship That Won the Civil War, Farrar, Straus, and Giroux, 2005, ISBN 0374166005, page 285.